When growing up, our family had a small hobby farm north of Perth, Western Australia. We also had some good friends who lived in the WA wheatbelt area, near Mukinbudin. My Father talked about getting some sort of tractor for our farm, and our friendly farmer "TW" from Mukinbudin mentioned he had an old one parked out on his property, and that we could have it free if we paid the transport. So, one long weekend we headed to "Muka" to see if the old tractor would work. It had been sitting out in the weather for decades, covered by some sheets of corrugated iron and old wheat bags. Once uncovered, it looked pretty far gone. We checked the oil, added some fuel, cleaned the two sparkplugs, and "TW" cranked engine over a few times to see that it was getting some lube into the pistons. Now for the real test, we primed it with a little petrol, and "TW" swung on the huge flywheel a few times, and it actually started up and ran. It belched a lot of smoke initially, but settled down after a few minutes. Dad had the tractor trucked to our small farm and we built a shed for it. It used power kerosene as its main fuel, but we would start it on petrol, and once warmed up, we would switch it over to use the kero. 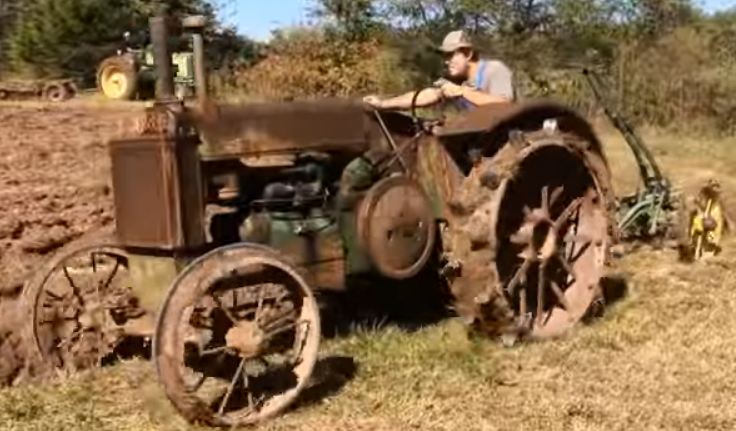 Below is a YouTube video of a restored tractor the same as ours. We used the tractor for many years but it ended up superceded by a nice diesel David Brown. The DB had rubber tyres ( Yeah! ) and had more gears and went faster. Also, it had electric start. The old John Deere was eventually retired and I last saw it in a kindergarten in a Perth suburb. All the dangerous bits had been removed, and it had been cleaned up and painted. The kids loved climbing all over it, and spinning the steering wheel.